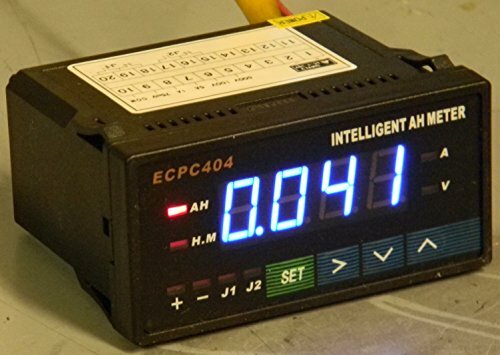 This advanced ECPC404 AMMETER AND VOLTMETER digital battery pack monitor features a unique counting feature to measure the remaining capacity of your battery packs amps, volts, and amphours. The ECPC404 constantly measures the current and sums up the total current usage over time to calculate the remaining capacity. The ECPC404 can be used to measure the capacity of and monitor any type of battery pack from 0 to 500V. • Dual alarm outputs J1 and J2 shut down the pack if the voltage or amperage goes above or falls below programmable limits! • Controlled be 3A 125VDC or 14VDC relays. We love to meet or beat any competitor's price on ECPC404 AMMETER AND VOLTMETER Intelligent Digital EV Battery Pack Monitor with Amp-Hr Counting! Dual alarm outputs J1 and J2 shut down the pack if the voltage or amperage goes above or falls below programmable limits! If you have any questions about this product by Electric Car Parts Company, contact us by completing and submitting the form below. If you are looking for a specif part number, please include it with your message.